Look at those names above, all legends! Now, I have reread Paul Smith’s run a bunch of times, either in trade form with From the Ashes, of which this issue is not included and several more times in Essential X-Men Volume 4. But I was still a bit hestitant to read the actual comic. I’ve been so used to it in black and white, or too much time has passed, I thought maybe it would not hold up as well. Or that I’ve been Mr. Paul Smith fan for so long, what if I am blind to the imperfections. Of course, I shouldn’t have doubted it at all, as this issue is outstanding and double sized! Issue opens with a landscape of Madrizar, and it is breath taking. Smith knows he has twice the amount of space, so he really goes all out with the establishing shots and his attention to detail is right there. One of the reasons, from what I have read, that he didn’t stay on the title long was due to how long it took him to do every issue as each panel is packed. Carol Danvers, now in her Binary phase, is busting the place up. Defeating and not caring at all for the Brood world. She rescues an Acanti, but it informs her that she is dying due to a Brood slaver virus. Carol agrees to take it out of its misery. That’s one more death that she will avenge. Carol sees Storm floating about in space, as her body died last issue. Storm tells Carol to join them in ‘our’ body, as Storm has merged with this baby Acanti. . Carol enters this baby Acanti’s mouth and is reunited with the X-Men. There is this incredible panel where you see the entire cast, including Lilandra, that should be used as the go to reference for sizes and height for the X-Men. Colossus is giant, Wolverine is barely as tall as Kitty is. I like they are not on a stealth mission or anything, so Wolverine is maskless, Kitty is wearing comfortable clothes as is Colossus. Storm is in her classic suit of the time, but in astral form as her body heals. The X-Men start joking around with Carol and Kitty can’t stand it. Cyclops, Colossus, Nightcrawler and her are all technically dying as they still have a Broodling growing in their stomachs. Storm continues explaining the repercussions of the failed transfer of memories. The Acanti she is merged with, is the next prophet-singer for the race. Its parent is what is being used as Sleazeworld’s capital city. The only way to set right with what once went wrong, is to go to the base of the skeleton and unleash the memories. Instead of killing the Queen Brood, she wants to make their final mission, if that is what it is, to be one of life. Wolverine wants to take the fight to the Brood and kill the queen. Wolverine has been done there once already and the creatures are deadly, and there is one that even the Brood fear. We get this awesome intense scene with Cyclops making a plan of action, as he wants to take the infected X-Men to the base and free the spirit but Wolverine objects. He doesn’t want to trust the success of the plan to those who might turn into Broods at any moment. Cyclops yells at Wolverine to just kill them now then, and take them out of their misery. This is the moment that Wolverine has been dreading. He made a deal with himself that he would gladly kill them to prevent super Broods from being made, but now that they are standing in front of him, he can’t do it as they are still in control of their minds and bodies, plus they are his friends. He makes up his mind and pops his claws. Kitty dashes between the two of them and tells them to stop. It is intense. Raw emotions and their lives are literally on the line. The X-Men gear up, in their proper costumes and prepare themselves for the mission at hand. In a very kinetic panel, where you see everyone heading to the transporter. How everyone is paced, you can clearly read the direction and momentum everyone has. Cyclops gets into it a bit with Lilandra, wanting to make sure they are about to go right where they want to go. Kitty stands up for Lilandra, stating she is a queen and should be treated as such. Lilandra speaks up for herself, she has set the correct place for them. Kitty makes an awesome “Beam us down, Scottie” joke and Cyclops says, “sorry, did you say something Kitty” and she does this little laugh. Claremont really has this comic running the gauntlet of high stakes but good humor and seriousness throughout the issue. We cut to the Brood, and Smith draws them in a way that is creepy. Or they are merely standing about, but they are creepy looking things. Reminds me of X-Men Legends II when you have to fight them for a bit and they just rush you in droves and they are easy enough to kill but the way they attack. Creepy. We learn that one of the X-Men is in telepathic communication with the Brood and is now a double agent, as their transformation is underway. One of the Brood soldiers wants to kill the X-Men but the Queen denies the request, as she is expecting five superbabies any minute. The X-Men teleport to the surface, and Wolverine reveals he has the sent of the soul. He has a thought of how Storm and Binary are doing and we get a page of Binary out right killing Broods. Storm is shock about how killing comes so easy to Carol and Wolverine, as they were soldiers. We are getting the building blocks to Storm’s change of personality. We cut back to the X-Men fighting the Brood. Cyclops is barking attitude at Wolverine, and poor Wolverine has to take note about how Cyclops is becoming the aggressor and Wolverine is having to be the leader. Also, how Cyclops and Wolverine seem to be bickering with each other, just like the ol’ days. Kitty gets attack by a giant orange amoeba. It is unsettling. She uses her phasing power to go through a wall. Unfortunately the others don’t notice and keep up their attack. She notices she has landed in a giant nest. In that nest are Brood skeletons that have been picked clean, and recently. In the very last corner, we get a tiny glimpse of a little purple creature, whose interest has been piqued. This is happening. Carol and Storm are still on the attack, but Carol is getting overwhelmed. Then the Starjammers show up! Wolverine throws out a comment about not seeing Kitty in a while. Cyclops is quick to state that she knew the stakes when they started this mission. Pretty cold, Cyclops! Wolverine finally gets close enough to Scott to note something different. In an amazing sequence, we get Wolverine jumping at Scott, Scott backing up in surprised and Wolverine ripping off his visor. To reveal the grossest thing to happen to Scott, he is part Brood now! He has these giant non-blinking Brood eyes! It is unpleasant! Now that he isn’t held back by the visor, he displays great skill in his optic blasts and is able to shoot both Wolverine and Colossus, even though they are on opposite sides of the room. Scott couldn’t accomplish this on his best day. Next the Queen and the cavalry, this new squad takes out Kurt and Lilandra and with that, the X-Men have been captured. Meanwhile, Kitty has been doing her best to outrun her own squad of Brood. She decides if she can’t run, she will phase to the floor below. She makes a dive for it and hands on her face, she is too exhausted to even use her power! The Brood close in, and with an ‘ahem’ we see what it looks like for the Brood to look scared. And it is satisfying. We turn the page and there … he … is! With a giant burst of flame, the Brood are dead and we see the cutest purple dragon shaped alien! Paul Smith gives us Lockheed, though not named yet. Kitty is shocked and not sure if she is next. One Brood soldier is left, he blasts at them, they dodge and the blast hits a wall, completely destroying it. Behind that wall is a glowing chamber that mesmerizes both Kitty and the Brood. Kitty hears lovely music, while the soldier is terrified. Both are still walking toward the light. Not sure what happens to Lockheed at this point, as he is not tempted by the light. Back with the X-Men and the Brood Queen. 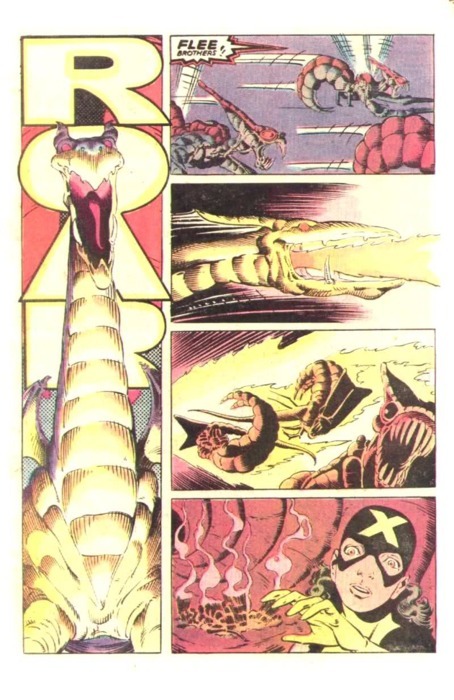 Cyclops loses control of his optic blasts and knocks the Queen out. Wolverine tricks Cyclops to shoot at him, using the blast to bust up the shackles he was in. In an fantastic panel that I keep having to look at, Wolverine puts one of his knuckles on the Queen’s head and the other over Cyclops, threatening the other Brood to stand down or he will pop his claws killing both. Also, when Wolverine took the blast, he lost a bunch of his costume. Smith gives us a closer view of one of the panels and if Wolverine did pop his claw, he would have a pair of brains at the end of his arms. The X-Men start back on their original mission. They come across a glowing chamber. Kitty walks out, now without her mask on. Which I didn’t care for that mask, it had a giant yellow X on a otherwise black mask. Seems like a perfect place to set aim too. 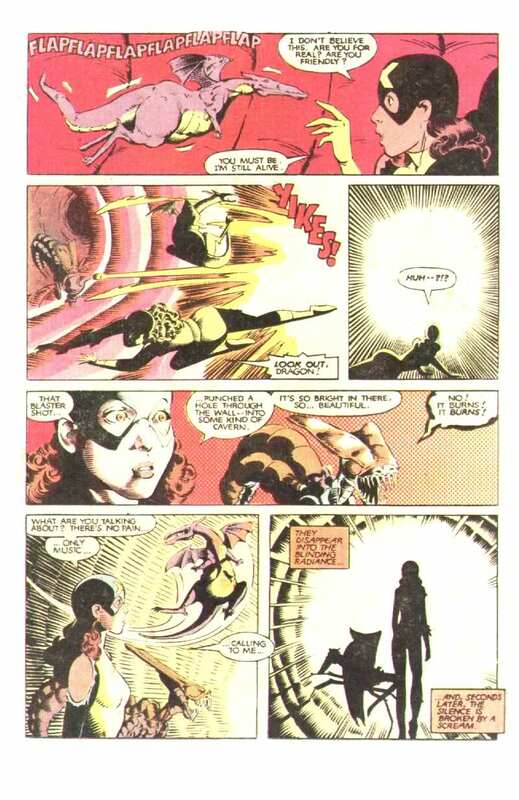 This is the Kitty Pryde that Paul Smith draws as great as he does. I also like the flow of her hair, which I know is a weird thing to comment on but there is just a curviness to it that I’ve been attracted too. Not attracted like Colossus, but there is a life there to it. That girl uses shampoo or something! I’ve tried to see what the real world example of that hair style is, but can’t seem to find a picture. When I do Uncanny X-Men 168, you will see what I mean. Anyways, Kitty comes out of the chamber, she notes that the Brood soldier that went in with her has turned into crystal. Colossus rushes over to her and picks her up, happy to see her alive. She asks them if they have seen a purple dragon, and they state that they haven’t. Everyone steps into the chamber. The Queen is first to start corrupting the soul, then the infected X-Men start infecting it. 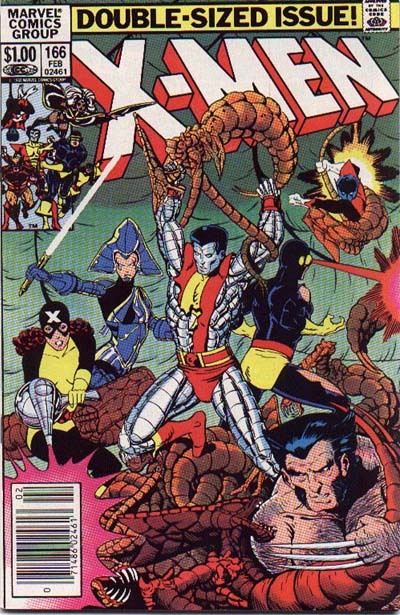 Wolverine prepares to kill his friends, but first, the Queen stabs him in the back and he cuts off her fangs. Now he is too weak to move. Luckily, Binary shows up and moves him. She comes back, braces herself and releases the soul. Once the soul and baby Acanti are united, everything is set right. The X-Men are healed and the Queen is turned to crystal, but not before revealing that these is still one more infected X-Man out there. Carol’s face is shown, she spent more of her cosmic power than she thought. 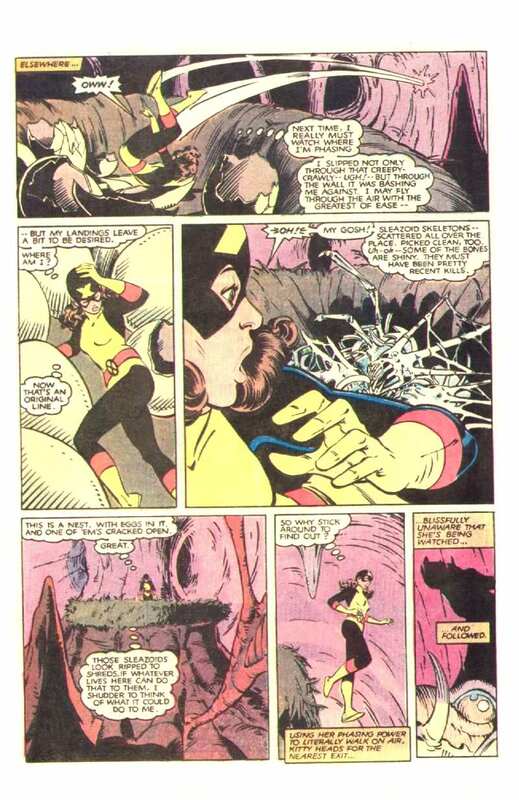 She flirts with Wolverine a bit before the planet starts to quake. Carol tells the Starjammers to teleport them to their ship. Kitty wonders about ‘her’ dragon. They are successfully teleported as the planet is destroyed. We see some Brood ships escaping, but their thorneworld is no more. During this time, Sikorsky is telling Wolverine to rest. Kitty tells him that when she is sick, she has to do things she doesn’t want to do. Hepizbah gets everyone’s attention as she introduces a fully healed Storm. All is right again. Except, Wolverine reminds everyone of what the Queen’s final warning was, and he knows exactly who it has to be … Professor Xavier! I like how this issue was double sized, but besides the first and last few pages, there were no ads.